David B. is a founding member of L’Association, a group of French cartoonists who banded together as publishers in 1990 and have revolutionized European comics with their groundbreaking approach to format, subject matter, and style. He has received many awards, including the French Alph’ Art award for comics excellence in 2000, and he was cited as European Cartoonist of the Year in 1998 by The Comics Journal. He lives in France. David B. spent an idyllic early childhood playing with the neighborhood kids and, along with his older brother, Jean-Christophe, ganging up on his little sister, Florence. But their lives changed abruptly when Jean-Christophe was struck with epilepsy at age eleven. In search of a cure, their parents dragged the family to acupuncturists and magnetic therapists, to mediums and macrobiotic communes. But every new cure ended in disappointment as Jean-Christophe, after brief periods of remission, would only get worse. Angry at his brother for abandoning him and at all the quacks who offered them false hope, Pierre-François learned to cope by drawing fantastically elaborate battle scenes, creating images that provide a fascinating window into his interior life. An honest and horrifying portrait of the disease and of the pain and fear it sowed in the family, Epileptic is also a moving depiction of one family’s intricate history. 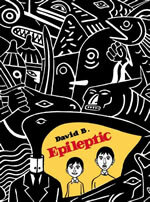 In Epileptic David B. records his family’s traumas over his older brother’s epilepsy and his parents’ dogged search for alternative cures from a parade of macrobiotic gurus, communes and spiritualists. His matter-of-fact, non-judgmental tone contrasts with his almost carved, emotionally intense imagery. David B. admits how as an adolescent he mistreated his brother, once almost letting him kill himself. David explores how his childhood inner rage and fantasy life helped him to cope, by transforming their struggles with the illness into symbolic battles. As his parents would never discuss the illness as he grew up, he embarked on this book in his thirties to open a dialogue with them. 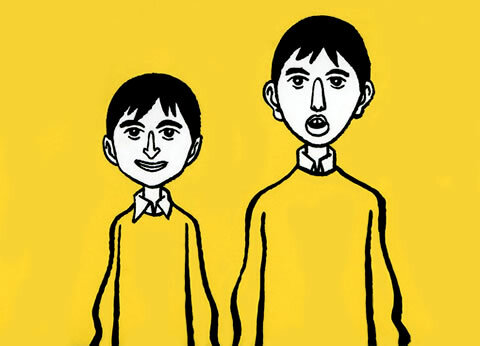 The result is one of the most affecting family testimonies in comics since Spiegelman’s Maus. A painfully honest examination of the effects of debilitating epilepsy on one man and his family, told through a combination of straightforward text and expressionist imagery that ranges in its palette from centuries-old symbolism to the secret worlds of childhood. Even as he shows up the hollow promises of every school of esoteric and alternative medicine his family encounters in their quest for help, David B. works a real kind of deeply human magic on the page - something forged from black ink and a soul’s struggle - that marks Epileptic as one of the first truly great narrative artworks of the new millennium. David B.‘s sprawling tale of his family, overrun by his brother’s illness and obsessed with curing it, is a masterful depiction of people searching for answers when there may be none. David B. is clearly one of the best storytellers in the medium of comics. 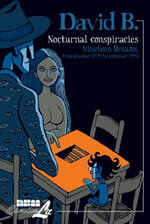 David B. invites us to experience nineteen explorative and most imaginative dreams he has experienced. Strange, scary, beautiful, funny and with a sense all their own, these are tales of the inner psyche. At night my dreams are filled with conspiracies, chases, terrorist attacks. Policemen, spies, and bandits meet me for weird shootouts. In my sleep, I find once again my liking for gangster stories and dreaming morphs my daily life into a police investigation. The repetition of these themes made me want to draw those dreams. I love their chaotic and poetic structure. I love their enigmas without solutions. Each of these dreams is a chapter in my dark novel.